Belgian linen is hand-primed with your choice of oil or acrylic primer and then impeccably stretched on finest-quality, 1½" profile, solid wood stretcher bars with keyable cross-braces from a renewable Pacific Northwest source. Larger sizes feature custom-size, corner diamond braces. 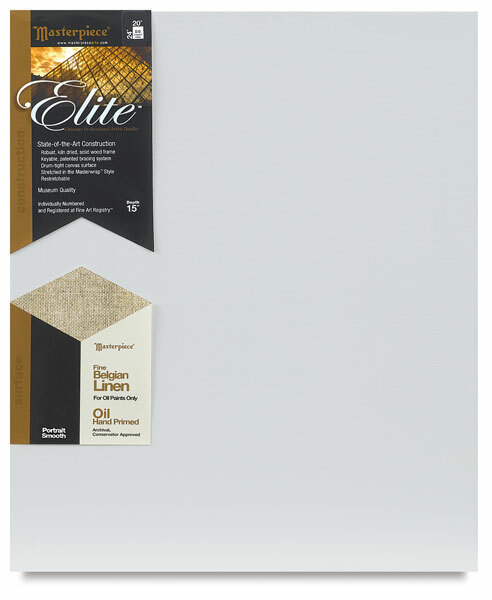 Oil-Primed Linen — Suitable for oils and water mixable oils, this canvas features two coatings of size and four coatings of oil primer. The final finished weight is 14.8 oz per square inch. Acrylic-Primed Linen — Suitable for oils or acrylics, this canvas features two coatings of size and four coatings of gesso primer. The final finished weight is 14.4 oz per square inch. Note — Blick now stocks the best selling sizes of the acrylic primed canvas for faster shipping! Please be aware that the sizes that Blick does not stock will ship directly from the factory (FOB). For items designated with the FOB icon, please allow 30 days for delivery and additional shipping charges. Best Selling sizes are stocked for faster shipping!